I’m really glad I went to sketch the guerrilla art sculptures right away on Tuesday. According to the latest story, people have taken all the pieces away by now. 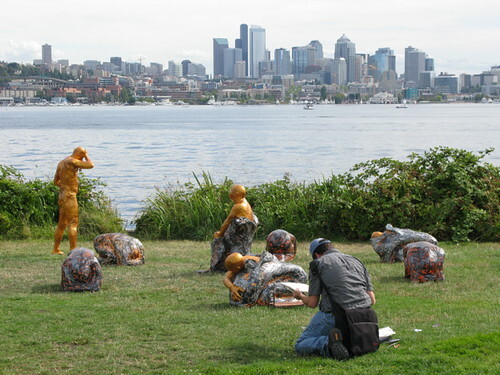 Since they were “gifted to the citizens of Seattle,” guerrilla artist Cyra Hobson said they no longer belong to her and told the Parks Department they could trash whatever was left after Labor Day, when the Department said they would remove them. But it just took hours for people to claim the present. Hobson went public on Wednesday as the creator. What a generous artist!